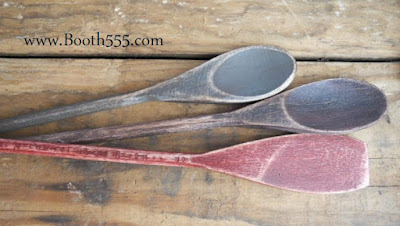 I am in love with making primitive themed wooden spoons! And this here is about my fourth batch of them so far. I'm addicted! lol. They have been really steady sellers at my Booth #555 at the Morehead Peddlers Mall. I've been bundling them in groups of 3 and pricing them for only $2.95. I do have more detailed ones that I've turned into magnets for sale as well, for $1.99 each. I start out with the plain ole' wooden ones you find at WalMart for a pack of 4 for $ .88. I lay them out on some chicken wire (best ever thing to spray paint on!) 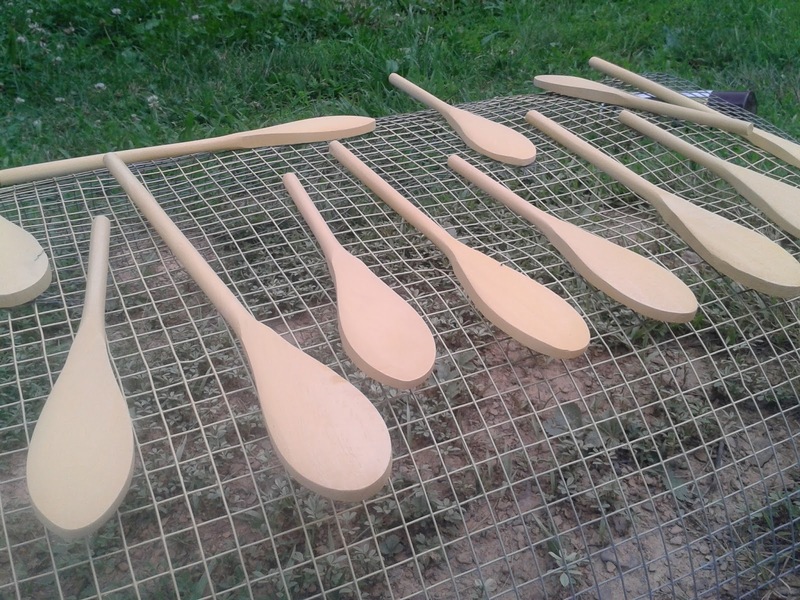 with the sides bent just enough to keep the spoons off the ground. Spray them a base color of whatever I have on hand. I like black, dark red and yellow as base colors. Then after spraying both sides, I let them dry a few good hours. Then I bring them all in and do another color with craft paint. Whichever color you want. As you see from my finished pics, I make a wide variety of primitive colors. And the reason I spray paint a first, base coat, is so that when I do my finish sanding, the base color kind of seeps through and makes them appear a bit older. Kind of rugged looking or aged. And another thing. To give it a sealed, finished look, I always like to take some Satin Varnish from the craft paint section and give each spoon a quick coat. And here's some more I've just finished up today. These say various kitchen words like, coffee, sugar, flour ect. And some reddish brown colored ones that say Old Crow and have the star and checkerboard on them. Those old crow hang tags are some I also made by using a simple stencil purchased from eBay. And see ya next time!